Home CARLY ROSE SONENCLAR CECE FREY DIAMOND WHITE EMBLEM3 FIFTH HARMONY PAIGE THOMAS TATE STEVENS TELEVISION VINO ALAN X FACTOR X FACTOR USA X Factor USA 2012 Results Show: The Top 6 finalists are revealed! 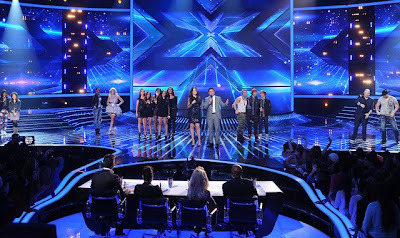 X Factor USA 2012 Results Show: The Top 6 finalists are revealed! Two 'X Factor USA' 2012 finalists were eliminated once again on the Results Show tonight, November 29 (Nov. 30 MLA Time) and the first to be voted out was the lovely Paige Thomas from the Young Adults category. Yeah, Paige Thomas got the lowest number of votes among the Top 8 Finalists. It didn't surprise me at all. (Check my X Factor USA 2012 Top 6 Predictions). Though she shouldn't leave yet basing on her performance last Wednesday, that's how it was supposed to happen considering her rank in the voting the past 3 weeks: #8, #10 and then #6. And now, she ranked 8th again. The first to be announced safe was the group Fifth Harmony, followed by CeCe Frey (Young Adults), then Emblem 3 (Groups), and previous weeks' top-ranked finalists Carly Rose Sonenclar (Teens) and Tate Stevens (Over 25s). In the Bottom 2 were Diamond White (Teens) and Vino Alan (Over 25s), who had to perform once again to convince the judges that they deserve to stay in the competition. Britney of course saved Diamond and voted against Vino. LA Reid picked his own and voted out Diamond. Both Demi Lovato and Simon Cowell sent Vino home. Vino was the 2nd to be eliminated (that despite being consistently in the Top 3 the past Results Show). Oh my!!! I have just realized that my prediction was right!!! Haha! I love it! And even the official ranking for this week, I got it almost perfect (I interchanged CeCe and Diamond in the 5th and 6th slot).